Ulster businesses are missing out on millions of pounds worth of opportunities in the renewables sector, according to business expert Dr Norry McBride. “Government funding opportunities and tax incentives make renewable energy generation increasingly lucrative for forward thinking businesses seeking to invest,” he explained. And the University of Ulster lecturer said investment in renewable energy provided a chance to lower energy costs, reduce the carbon footprint and raise additional revenue through the government ROCs (Renewable Obligation Certificates). 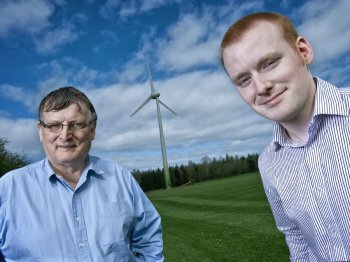 Next month, business specialists from the University of Ulster and experts from across the UK will be sharing their insights into how local firms can use renewable energy to their advantage. A conference, entitled ‘Profiting From Renewable Energy’ is inviting small and medium businesses, farmers and any other interested party to attend the free event, hosted by Ulster’s Department of Business, Retail and Financial Services. The event is hosted by the University of Ulster as part of MicrE, an Interreg (Northern Periphery Programme) funded project which aims to enable the usage of waste products to create energy. Derek Bond, from Ulster’s Business and Management Research Institute, highlighted the importance and significance of the day long conference which will be held on Monday 9 May at the Templeton Hotel, Templepatrick, from 9.30am. “Energy costs are spiraling with no sign of relenting. In this turbulent economic environment businesses should be seeking to reduce costs, when and where possible,” he explained. “Over the duration of our research we have established that not only can renewable energy be a viable alternative to fossil fuels it can also reduce costs. Dr Norry McBride, from Ulster’s Department of Business, Retail and Financial Services, added that they hoped the event would also help promote the benefits and impacts of renewable energy. “We are particularly focussed on targeting SMEs (small and medium enterprises) and the farming community, in order to assist them in their consideration of procurement and evaluating alternative energy sources for their businesses,” he said. During the conference, experts will give a short presentation on a range of the available technologies and advice will be given on the potential funding options and tax breaks available to investors. Admission to the Profiting From Renewable Energy conference is free but places are limited.